WARNING: This review contains more spoilers than an LA street race, so if you don’t want to know the score, look away now. A few years ago, Russell T Davies was presumably sitting in a Cardiff pub one afternoon with Julie Gardner when they both started to wonder “Who would win if the Daleks met the Cybermen?”. This, of course, was hardly a new question. The fans have been asking the same thing for many years. It’s right up there with ‘What’s the Master’s backstory?’, ‘Did Jamie survive?’ and ‘What if the Doctor was a woman?’. The result is a slew of fan-fiction, much of it dreary. Similarly, the episode that Davies’ question produced – the ‘Army of Ghosts’ / ‘Doomsday’ two-parter – was third-rate. The answer to the question, of course, was the Daleks, by a long shot, although that’s because the Cybermen – the real Cybermen, I mean, not the parallel universe stormtrooper allegories (memo to Russell: Terry Nation did the ethnic cleansing thing long before you got there) – were never really developed as universe-conquering warriors, at least not to the same extent as the Superior Beings from Skaro. Fast forward a few years, and one can picture Steven Moffatt in the same pub, perhaps sharing a pint with Matt Smith and Arthur Darvill, and one of them coming up with the idea of grouping all the Daleks together, and running that as an episode’s principal gimmick. This would, of course, have the fanboys salivating in their basements: the very idea of an episode that was actively designed to be paused and watched again and again to get all the references! Cue a frame-by-frame analysis of any scene involving a Dalek, frantic Google image searches for reference purposes and then a rush to get it all on your blog before the first episode torrent is online. 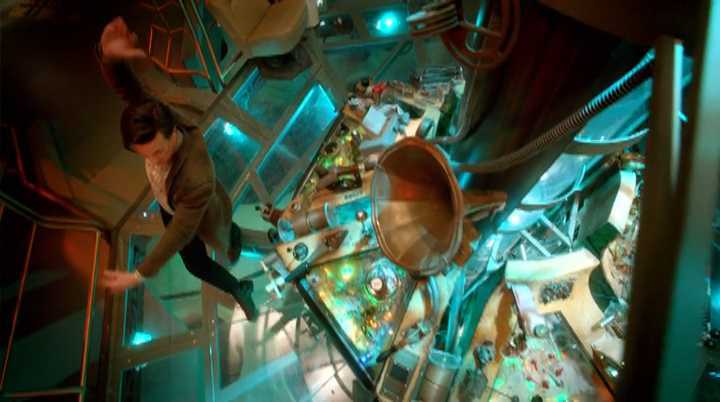 Moffat has already said that his dramas are designed to have replay value – which is presumably why he feels no guilt about making them as complicated as possible, on the grounds that everyone’s playing back a TiVo recording or watching on iPlayer – making stop-start and hang-on-a-minute-I-thought-the-Doctor-lost-his-jacket-just-rewind-that-a-second moments a regular part of viewing. I’m not really complaining about this: pausing to explain what’s happening is a regular part of my sessions with Josh, and whatever the critics say about it being too complicated, kudos must extend to Moffat for at least not treating us like idiots. But within hours of last night’s episode, comments of “Foul!” were spreading over the internet. The central premise of ‘Asylum of the Daleks’ – that it features every Dalek ever – was a bit of a waste, really, because from what I’ve been told they were rather hard to spot. 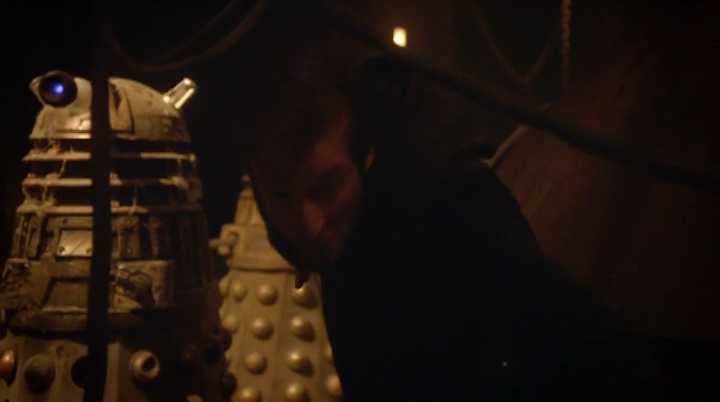 I should point out at this juncture that I’m the wrong person to ask about this, because despite my levels of geekery I do have great difficulty telling one Dalek from another, unless one of them happens to be a) made of stone, or b) Power Rangers red. Ask me to talk to you about body shape or colour of the eye stalk, and I’m stumped. So perhaps that’s why I didn’t care that the special weapons Dalek was one of the few recognisable models to make a visible appearance. And to be fair to Moffat, he said that the episode would feature every kind of Dalek; he didn’t specify that we would see them. (“Coming next week,” said Gareth, “the Rani, Sutekh and the entire cast of Cabaret! Outside the building the Doctor was occupying!”) Besides, the central failing of ‘Asylum of the Daleks’ as a Doctor Who episode has nothing to do with the variety (or lack thereof) of Daleks on display. It’s simply that it was crap. We should probably look at this in context before we go any further. Series openers are seldom the sort of episodes that venture into BAFTA territory. ‘Rose’, for example, was a nice introduction to the show but fails to stand up as an episode in its own right, being full of irritating moments, most of which involve Jackie Tyler. Likewise, ‘New Earth’, the first episode that really breaks in David Tennant, was second-rate (and featured the return of a character we didn’t like much in the first place). ‘Smith and Jones’ was lacklustre and featured unnecessary fawning. ‘Partners in Crime’ was “the children’s episode” (featuring, as it did, a selection of wandering Pilsbury dough monsters) and its sins are therefore excused purely on the grounds of intended audience. 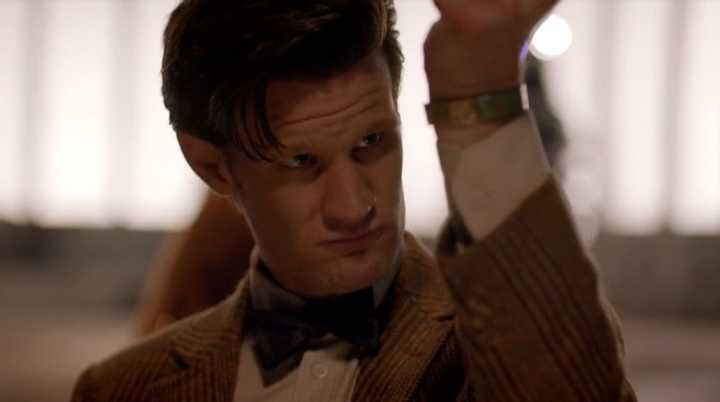 ‘The Eleventh Hour’ was great. Nonetheless, the general trend is for the first story of each series to establish the tone, but not necessarily the standard of writing. So from that perspective the fact that I spent most of last night rolling my eyes and checking my phone shouldn’t have come as much of a surprise. But still. There’s bad Doctor Who, and then there’s bad Doctor Who. This was, for the most part, bad Doctor Who: and I speak, by the way, as someone who really enjoyed the last Christmas episode. From the opening scene onwards, it’s clear that BBC America have put their stamp on this in a big way to sell it as ‘adult’ drama. Gone (for this week, anyway) are many of the eccentricities which made Smith’s Doctor so likeable. In their place is an awful lot of frowning. In the opening of the six-minute teaser (yes, you read that correctly) the Doctor answers a distress call on Skaro, realising too late that he’s walked into a trap. There is a lot of moody lighting and scowling and some measured, almost introspective mumbling, but it’s no Ashes to Ashes. This is the moodiest I’ve seen the Doctor since ‘The Twin Dilemma’ – indeed, Smith’s performance throughout is as out-of-character as Baker’s in ‘The Seeds of Doom’. I do hope he lightens up a bit; he’s no fun when he’s so miserable. After the Doctor is captured, we get re-acquainted with the Williamses Ponds – who, it seems, have spent the last few months becoming unacquainted from each other. The prospect of Rory and Amy sitting on the cusp of permanent separation will raise eyebrows for some – it’s all explained later, of course, but Rory has for some time been the lesser of Amy’s loves, and everyone knows it (which would suggest, perhaps that the question that must never be asked should in fact be “If your house was burning down, Amy, and there was only time to save the Doctor or Rory…”). It seems that now enough is enough, and Amy’s called away from a fashion shoot to sign divorce papers, but before you can say “River’s your daughter” they’re spirited away in much the same manner as the Doctor: by a human wearing a Dalek eye stalk. Talk to the hand, baby. Seriously. I can only assume that the Daleks have developed this kind of technology very recently, because otherwise why didn’t they use it to conquer the Earth – or destroy the Doctor – yonks ago? No more warships, stolen planets or reality-destroying bombs: just a few covert operatives taking out the world’s leaders, and then watch as anarchy descends, and then swoop in with a couple of drop ships and you have a swift victory. What’s particularly refreshing about these scenes, of course, is that the human assassin that doesn’t know it’s really part robot until stuff protrudes from its skin is something that’s never been done in Doctor Who, even recently. There has to come a point where Moffat runs out of things to self-borrow. 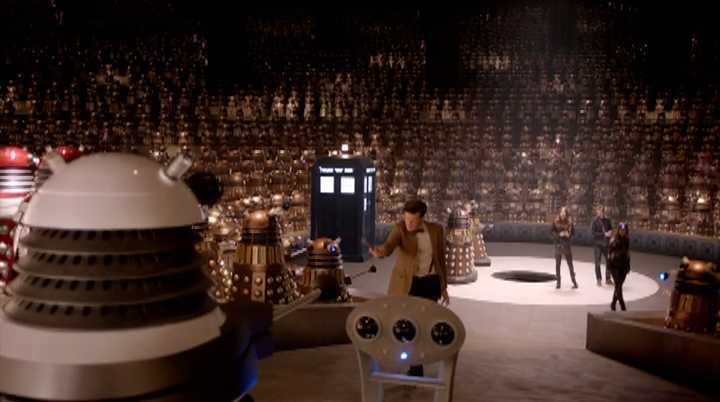 A multitude of CG Daleks. Which is impressive, even if it’s a little Star Wars. I can’t be bothered to talk about the rest of the plot. It isn’t just that it’s half past five in the morning here and I’ve been up for the past hour working on this review after settling Thomas back to sleep only to find myself fighting insomnia. It’s just not very interesting. Suffice to say that there is running. In slow motion. Which, of course, is the only way to do it when the corridor behind you is full of pyrotechnics that you want to show off. – or at least that’s clearly what we were supposed to think, until it transpired that this was from the first episode, which kind of takes away any element of surprise. Then, dear God, there’s more running. You will have gathered that the colour scheme for much of this episode is brown. 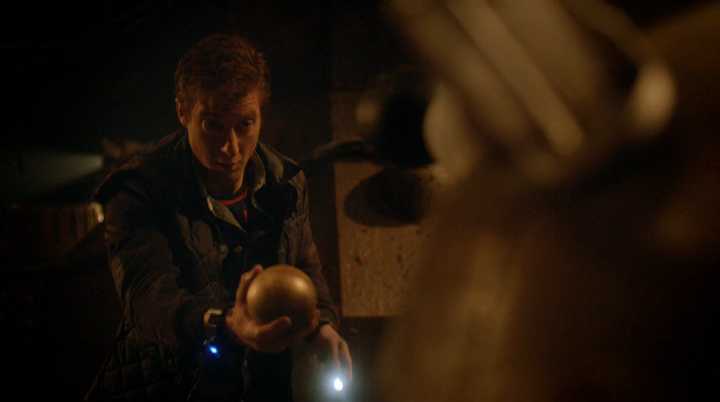 Said running is preceded by a supposedly amusing scene where Rory comes across a bunch of broken Daleks in the middle of an underground passage, who are just waking up and can only manage to mumble “Eggs…”. Rory is presumably still thinking about soufflé (we’ll get to that) and realises only too late what they really mean. Unfortunately the Daleks’ catatonia has rendered them incapable of shooting straight, as is evidenced by the fact that Mr Williams Pond manages to avoid blasts from a dozen death rays without batting an eyelid. Elsewhere, ‘Asylum’s “heartrending emotional sequence” box gets ticked courtesy of a ‘difficult’ chat between Amy and Rory – who finally voices aloud what we always knew and informs Amy that he loves her more than she loves him, a claim she vigorously denies. 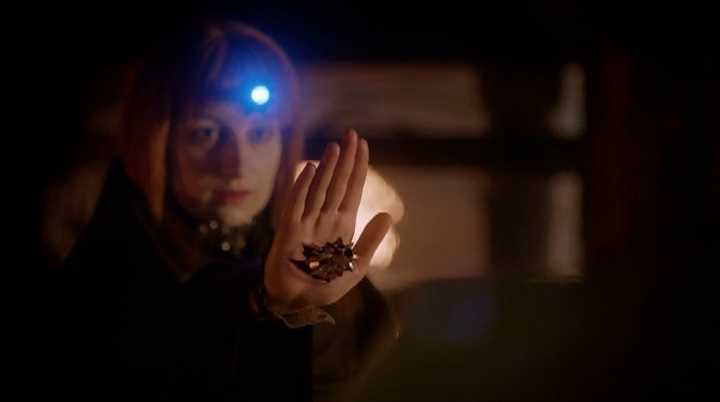 It’s difficult to be logical when you’re two steps away from growing an eye stalk, but it’s hard to see sense in Amy’s claim that she’s outdone his Pandorica epoch by giving him up. (Plastic man standing outside in the rain for two millennia? Pah. I THREW YOU OUT OF THE HOUSE BECAUSE I CAN’T HAVE YOUR BABIES!) 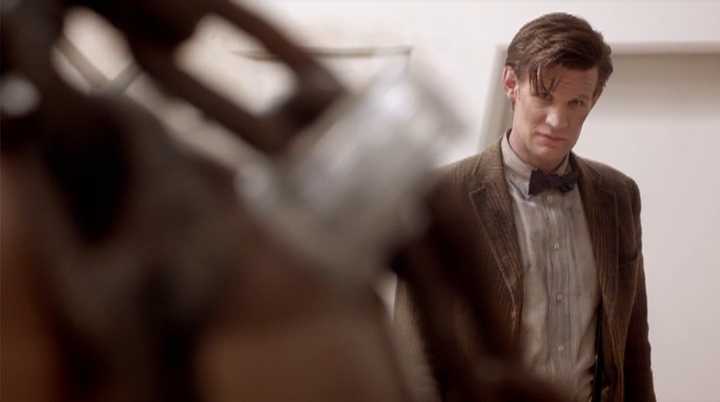 In what is one of the episode’s better twists, it transpires that the Doctor engineered this whole confrontation so that they could iron out their marital problems. Maybe the answer to the first question is ‘Ruth’. I’d rather have that, of course, than the Doctor prannying about in the TARDIS crying “Doctor Who! Doctor Who! Doctor Who!”. 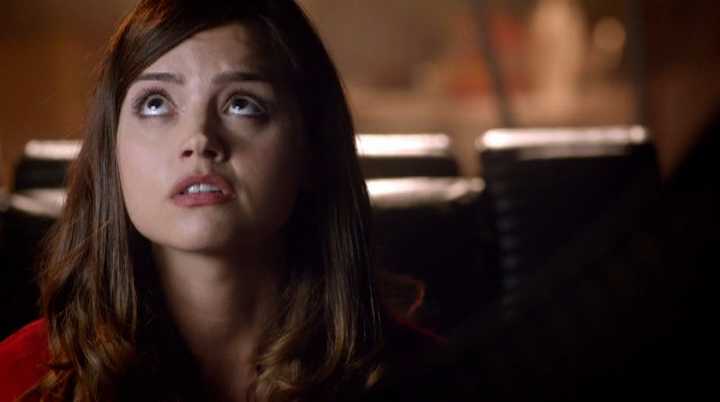 We’re some 1400 words into this review and I’ve not even mentioned Jenna Louise Coleman yet. That’s largely because you always bookend negative feedback with praise. I opened by implying that however dull the central premise, coming up with a fanboy idea was nothing new. I will close by singling out Coleman’s supporting character as one of the best things I’ve seen in New Who since Sally Sparrow. Oswin Oswald sounds like the name of a villainous financier in a Disney comedy, but instead she’s an entertainment manager who’s crash-landed on the Asylum and has spent the last eleven or twelve months living like a zombie survivor by nailing planks of wood over her door to fend off Daleks, and making bad soufflés. The fact that she’s survived for a year doing this should suggest that something is amiss, as the Doctor notices when he asks her where she got the milk. The twist, of course, is that Oswin is a Dalek, who entered a fugue state after conversion in order to hide from reality, as we discover when the Doctor finally tracks her down. Unfortunately any effectiveness this scene might have had is undermined by the subsequent “fight it, Oswin, fight it” dialogue in which Oswin, on the verge of exterminating the Doctor, manages to hang on to her humanity for just…long…enough…for the Doctor to…escape…seriously, I know there’s only so many ways you can do the man-machine battle, but it was all I could do stop thinking about Alfred Molina at the end of Spider-Man 2, bellowing “I WILL NOT DIE A MONSTER!”. It was fairly obvious, really, that Oswin would die, probably revealing herself as somehow non-human (the ultimate hidden Dalek slave, I’d initially thought) in the process: this isn’t 1983, and there’s only room for three in that TARDIS, unless River’s gone for another swim. 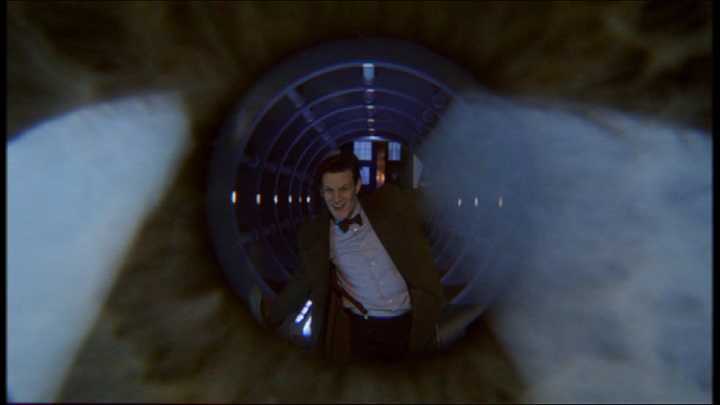 Despite its clichés, the aforementioned scene in which the Doctor discovers the truth was at least reasonably put together, and refreshing in that having someone wave at you from a space craft hidden inside a robotic shell is something the series hasn’t done at all, ever. In the aftermath of the River / Melody saga and the resolution of the Doctor’s death I suppose we needed a new mystery, and despite Moffat’s assurances that there would be no arc this season he obviously wants the fans to have something to deconstruct on the internet. A Time Traveler’s Wife scenario (#2) is precisely what we’ll be anticipating and therefore precisely what probably won’t happen; #1 is more likely but I’m not going to speculate for too long. The one thing I’ve learned with our chief writer over the past couple of years, exemplified perhaps by this episode, is to expect the unexpected. Just don’t necessarily expect that it’ll be any good. Amy can’t have children, yet Melody Pond is her daughter. HOW?! I honestly hated this episode, I don’t even want to think about the next one – dinosaurs in space – what?! Yes, but Amy *could* have children – indeed, Melody was conceived in the TARDIS on their wedding night – but when she gave birth at Demon’s Run, they apparently sterilised her. So they can’t have any more children. This episode does seem to be getting a lot of undeserved praise. Thanks. Yes, it seems to be something that’s happened a lot lately, with increasing frequency…! Thank you. At last a review of this episode that doesn’t waste a thousand words slathering praise on Moffat’s writing. His twists are about as amusing as M Night Shyamalan’s. “The Sixth Sense” was decent enough, but we are most assuredly at “The Happening” by now. I saw the “Dalek all along” twist a mile away (shortly after we met Oswin, in fact. It irritated my girlfriend that she didn’t spot it first) and spent most of my time wondering a) how there was a Skaro after the Time War, b) how there was an ASYLUM of Daleks after the Time War, c) how there were any of the inferior Dalek models left after the iDaleks were made, d) where THIS Dalek battlefleet has been hiding all this time/cloned itself from/found a time(plot) hole to fall through, etc. e) why the Daleks would keep imperfect, crazy Daleks around (let alone a planet full of them) after it is proven that their hatred of all things inferior leads the iDaleks to exterminate their predecessors, (a corollary: why the Parliament didn’t ORDER daleks to go down there, and when they balked, not just exterminate them for feeling fear, an emotion long since established to have been removed from the species) f) how the ship crashed through a shield that was impenetrable to the daleks (despite them building it) that was later penetrated by the Daleks own technology, and g) how and when Rory was going to die this week. That’s quite a shopping list! Glad you liked the review. I do feel like I’m in a minority. I confess I gave up on Shyamalan after Unbreakable (which I admit I enjoyed) because I could see then that he was writing gimmicky twist movies. By all accounts he’s stopped doing that now, but his stuff is still rubbish. At least Rory came out of it alive this week! Yes, umm, hullo. 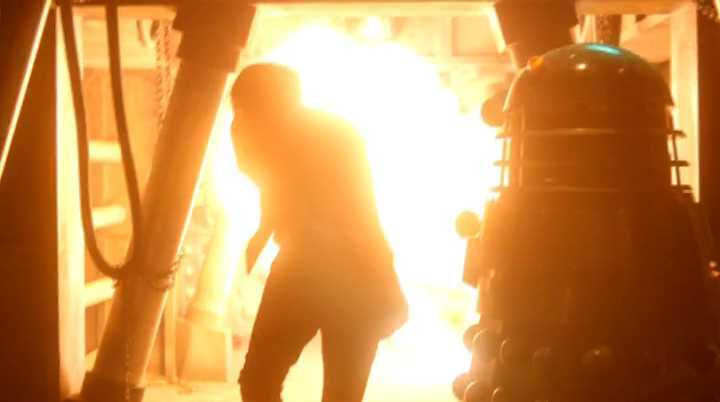 Why didn’t the daleks teleport bombs onto the surface of the planet? Yes, thats it, goodbye. Good point well made! There may have been a reason but to be frank I don’t have the inclination to watch the episode again to find out what it is…!